First, select a vehicle plan that vaguely relates to your vehicle. You can do this by pressing down on the vehicle plan then dragging it left or right. Next, you have the option of adding the vehicle dimensions by pressing the underlined text surrounding the car. This step is optional and if you choose not to enter any dimensions the positions of the objects within your vehicle will be displayed as percentages. The third and most important step is to position the components of your vehicle on the plan. You will notice a selection of components below the vehicle plan. You can move any number of these to the vehicle plan by pressing and dragging to your desired position. As soon as you release the component a popup is displayed asking you the weight of the component. You do not have to enter the weight right away as you can display it again by clicking on (or pressing down and releasing) the live component. 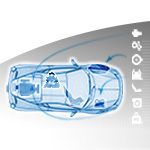 However, you will need to enter the weight before the CoG (center of gravity) and weight distribution can be displayed. Once you have entered the weight you will notice orange cross hairs are displayed with the CoG symbol at the intersection. 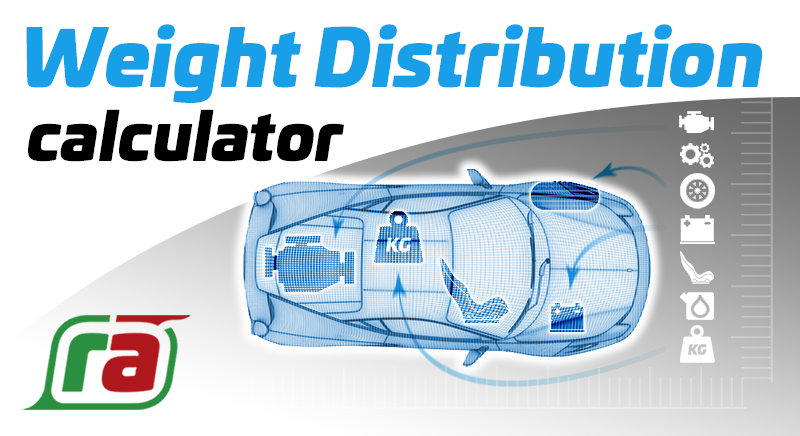 You will also notice the actual weight and weight distribution is displayed.